Magie. Astrologie. Cartomancie. Chiromancie. Graphologie. Spiritisme. 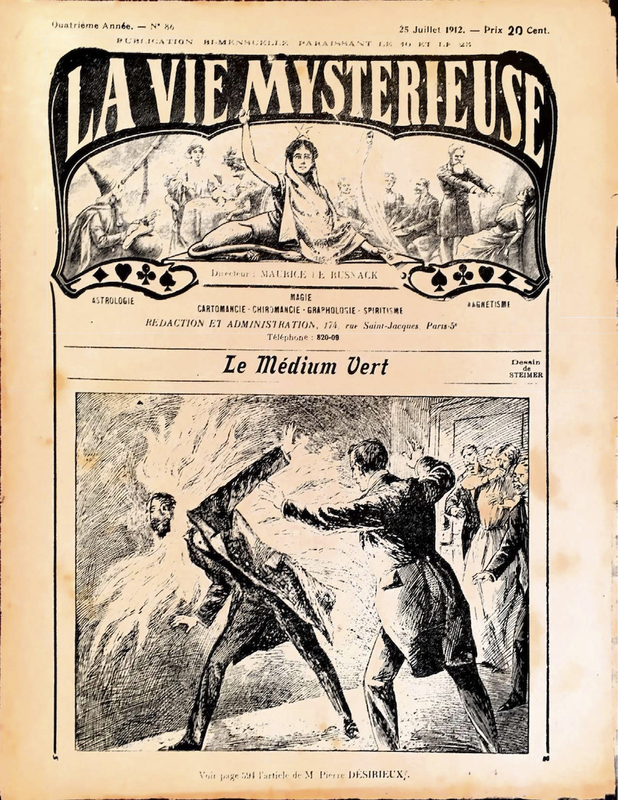 Magnetisme / Journal Populaire Illustre des Sciences Psychiques et Occultes. Etude des Forces Inconnues dans toutes leurs manifestations: Magnetisme, Hypnose, Telepathie, Science Astrale, Suggestion, Spiritisme, Psychologie, Mediumisme, Clairvoyance, Occultisme, Religion, Philosophie. Paris, France. Language: French. Editor: Papus and Professor Donato; Maurice de Rusnak; Fernand Girod, secretary. Corporate author: Societe internationale de recherches psychiques1/1, January 1909-1914. 16-24 pp., 5 francs (6 abroad). "Prof. Donato" founded this journal and edited it with Papus (Gerard Encausse). Donato was the name used by the Belgian Alfred Edouard, "Baron" d'Hont in his stage performances as a hypnotist and magnetizer in the 1870s and 1880s. He was a very famous figure and was responsible for exciting Charcot's interest in the possibilities of hypnotism. Donato was said to have been born, variously, in 1840 or 1845, and--unfortunately for his having played a hand in this journal--to have died in Paris in 1900. The story of his death was so widespread that Donato took up his pen in the journal in 1913 to deny his own death, offering to respond to correspondents who wrote to the journal about the question. The mystery remains unsolved. Prof. Dicksonn, in his La Verite sur le Spiritisme (1917), p. 112, who contributed to the journal and had been a close friend of Donato, says that the real Donato died about 1900. Papus assisted Donato as an editor of the journal in its early days and went on to play the same role in the Almanach de la Chance/Almanach de la Chance et de la Vie Mysterieuse in 1905, and later, and in 1911 contributed a preface to Donato's Cours pratique d'hypnotime, de magnetisme, et de suggestion. The journal listed among its "principal collaborators" a who's who of the major and minor figures of the French fin-de-siecle occult world and the epigoni in the years before World War I: Papus, Hector Durville, Comte de Larmandie, Ely Star, Jules Lermina, Favius de Champville, Gabriel Delanne, Ernest Bosc, et al.--many of whom figured also in Papus's Societe Internationale de Recherches Psychiques, founded in 1908. It was a well-illustrated popular exposition of the occult arts listed in the subtitle, with short articles on magic, astrology, scrying, famous mediums, will cultivation, personal magnetism, photographing human rays and spirits, amulets,and regularly carried short occult novelettes ("Earthmen on Venus," "The Call of the Phantom," etc.). Noted in the exchanges of Mysteria, April 1913 and in World's Advance Thought the same year. BNF; BM Lyon; BL; University of Texas; Koninklijke Bibliotheek, Den Haag. Many of these issues courtesy of Brandon Hodge and The Mysterious Planchette.